Compliance with federal requirements is a challenge for medical professionals, as new laws, new technologies, and new ways of working continually call for new solutions. Excel Anesthesia, a 26-physician group, found a long-term solution for secure, compliant e-mail in Microsoft Office 365. By choosing Microsoft, the practice also avoided 83 percent of the cost of an on-premise solution. It can be difficult to meet federal privacy and security requirements for IT when your workforce isn’t just communicating over a protected local area network, but also wirelessly over mobile devices. And it can be even more difficult when your workforce is 100 percent mobile, 100 percent of the time. That’s the challenge that faced Excel Anesthesia and its Head of Compliance, Michael Walsh, M.D. The company’s 26 anesthesiologists don’t work out of offices; they work in hospital operating rooms and other surgery and out-patient facilities, and travel constantly among those locations. They have to coordinate and update schedules, review patient files, and communicate and collaborate with colleagues, all on-the-fly. Combine the issues of mobility with those of compliance with HIPAA, the Affordable Care Act of US, and other regulations, and few healthcare providers face greater challenges than Excel Anesthesia. For the past 18 months, Walsh has led a practice-wide effort to upgrade compliance procedures. Ensuring secure email—which often contains private health information (PHI)—has been a key focus. That means more than just securing email transmission; it also means securing email storage. Even when messages are transmitted securely—which can’t be assumed with free, public email—those messages remain only as secure as the PC or mobile device on which they then reside. With physicians often using their own computers and phones, standardization, let alone security, can be elusive. And the risk is immense; the cost of mishandling PHI can run into the millions of dollars. Excel Anesthesia had no computer servers to support email, and it was reluctant to invest in the hardware and maintenance that an on-premise email system would require. While it wanted to keep costs low, it also wanted a solution that was highly reliable and available. Its practice had reached a critical size and was continuing to grow. It couldn’t wait any longer to address the email situation. Fortunately, it didn’t have to. Its technology provider, introduced the company to Exchange Online, the email solution included in Microsoft Office 365. Office 365 for business provides virtually anywhere access to Office applications, enterprise-grade email, file sharing, conferencing, a public website, and more. Varying combinations of service are available through a series of subscription options. “Given the crucial issues surrounding compliance, we asked our attorney—not just our techies—to evaluate Office 365,” says Walsh. “He told us that we couldn’t do better than to choose Microsoft: it stands behind its products and will likely be around to provide that support for many years.” Most important from a compliance perspective, Microsoft signed a Business Associate Agreement (BAA) with Excel Anesthesia. That means that Microsoft—not Excel Anesthesia—takes on the risk stemming from compliance gaps in the technology. Consultant helped the company to deploy Office 365—along with encryption and passcodes—on the mobile devices that its physicians already used. The practice introduced its physicians to Office 365 in phases, starting with Exchange Online, since email is such a common, essential function. Links in email messages provided introductions to SharePoint Online and Lync Online. With guidance from Consultant, the practice used SharePoint Online to roll out a robust compliance program with online policies that replace traditional, often inaccessible, hard-to-update “black binders” containing pages of regulations and policies. Excel Anesthesia now has the secure, reliable, and cost-effective compliance solution it wants—with a new level of business agility as an added benefit. The company now tracks compliance tasks automatically and has a central, online location for collaboration among members of its compliance committee. And it spots and corrects chart deficiencies in half the time it used to take. “The Microsoft data centers behind Office 365 provide levels of security, fault tolerance, replication, and backup that we couldn’t afford on our own,” says Walsh. Microsoft also provides a financially-backed service-level agreement with 99.9 percent availability. Security in the cloud with Exchange Online means that the practice has no on-premise servers to fail, to be stolen, or to be lost during office moves. With Office 365, the practice pays a low subscription fee--$8 per month per user—instead of buying and maintaining its own servers. That saved it 83 percent of the first-year costs for on-premise email. Excel Anesthesia pays only for what it needs, and can expand its subscriptions to support continued growth. The practice used to choose only local vendors and professional services firms—people it could meet with frequently, and on short notice. But some of the providers that it wanted to work with aren’t in Dallas—such as Anesthesia Compliance Consultants, located hundreds of miles away in Cincinnati, Ohio. That firm was using Google Docs until Walsh and his colleagues showed them the Microsoft alternative. The consultants made the move to Office 365, and for many of the same reasons that convinced the practice. Excel Anesthesia is now the firm’s client, and the two hold web and video conferences several times each week, without any concern for the vast distance between them. 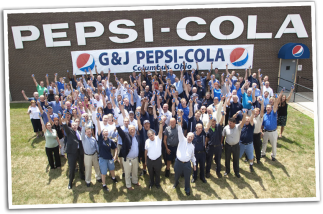 G&J Pepsi-Cola Bottlers, Inc., the US's largest independent Pepsi bottler, consistently looks for ways to improve its operations to drive business growth, and is an IT standard-bearer in the bottling and distribution industry. Like many companies fighting for market share, G&J Pepsi's Chris Witzgall, Vice President of Information Systems, is constantly exploring ways that technology will drive operational efficiency throughout the company's 11 locations in Ohio and Kentucky so that he not only reduces costs, but supports sales, marketing, production and other departments in order to grow revenues. 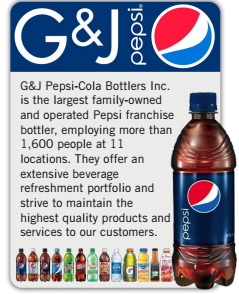 G&J focuses mostly on the activities that impact their core bottling and distribution centered businesses. Then they collaborate with a small number of partners to outsource non-strategic commodity workload. With the help of a consulting company., G&J Pepsi's IT team removed workloads by moving email and collaboration tools to the cloud using Microsoft's Office 365. They boosted their ability for real-time from anywhere on any device communication with LyncEnterprise Voice. Furthermore, they added Windows Azure to enable disaster recovery from the cloud. Then G&J outsourced the support of Office 365, Lync Voice, and a major piece of their server infrastructure to Outcousing company. By shifting some processes to cloud computing and outsourcing others, G&J Pepsi became more agile and efficient. The transition allowed Witzgall's small IT team to stop maintaining, monitoring, patching and fixing the complex configuration problems with these workloads. By shifting to Office 365, G&J avoided spending $30,000+ in future hardware and software upgrades needed to support the latest version of Exchange. "We were spending many hours a month on Exchange patches, backups and maintaining storage for the virtualization environment," Witzgall said. "Email is one of those areas we feel is more of a commodity service, and any time we spend supporting it is not time well spent." Witzgall has worked with consultant on multiple projects to automate G&J's infrastructure. He views consultant as an extension of his IT team, and the partnership allows him to service the company's 1,600 employees with a small IT staff. In fact, the first time Witzgall engaged with consultant to explore moving to the cloud, consulting company recommended waiting. “G&J had already upgraded their infrastructure to the latest releases, their infrastructure was solid and running well – so it made sense for them to wait until the next major revisions were released in the cloud before they migrated,” says President of cloud consulting company. The consultant team walked Witzgall through possible options for migrations and technology that would allow G&J employees to access information from any device with a single sign on. Consulting company then gathered information to help Witzgall make the business case for moving the company's email to the cloud and adding Lync and Azure. Consulting company completed a technical assessment to make sure G&J could easily move to the cloud, and then a business assessment to make sure that such a move aligned with company business objectives. Consultant also provided a detailed hard cost return-on-investment report demonstrating how the new technologies would help G&J not only save money but give employees tools to help them operate and communicate more efficiently. Pre-Assessment Analysis : G&J Pepsi also received a written plan explaining how to get ready for a cloud migration and a project plan outlining who would own what part of the migration to make sure everyone was on the same page. The process also includes documentation on how to set up the new system, how to cut users over and a communication plan IT managers use to tell employees what is going to happen and when. Consultant also provides end user training guides so employees know how to use the new system’s functionality. Consultant's role was to manage the project, build the redundancy and failover capability and ensure there was no data loss in the migration to Office 365. Because Consultant carefully watches Microsoft partner incentives, consultant was able to alert G&J Pepsi to funding from Microsoft that allowed G&J to reduce the consulting costs of installation by 75%. Additionally, Consultant helped G&J secure and utilize 100 free licenses of Office 365 and a promotion that offered an 80% cut in the retail cost of Office 365 licenses, saving G&J Pepsi's $100,000 over three years. "The implementation was very smooth," Witzgall said. "Consultant handled the initial set up and testing, which was crucial. Then they helped us get the first set of users up and going, and we took it from there, with consultant acting as a resource when we needed it." Moving to Office 365 allowed G&J Pepsi to eliminate $1,500 in annual spam filtering costs and another $2,500 in annual maintenance for Symantec Enterprise Vault, which the company used for email archiving. The move to the cloud-based system also freed up about 3 TB of storage, and it allowed G&J to give everyone in the company access to email with Microsoft’s low cost kiosk emails plans. HR will be streamlining their processes with this new digital communication channel. The bulk of G&J Pepsi's 1,600 employees work in 11 locations in two states. In addition, many employees work from home, and the salesforce operates in the field on more than 300 routes. Because of the dispersed work force, G&J needed a more robust and mobile friendly collaboration system. Consultant helped them upgrade to the latest version of Lync Enterprise Voice, which give them a new level of functionality including better mobile access and enhanced web meetings. Upgrading to Lync 2013 "allows people to participate in meetings easier, and access corporate information in real time," Witzgall said. Mobile employees previously printed information from their laptops or had to drive around looking for good wifi Internet connections if they wanted to participate in meetings while they were traveling. Now, they can provide customers instant information from their devices of choice and join meetings from their smartphone, tablet or other device no matter where they are, and no matter what operating system their device uses, he said. Like many companies, G&J Pepsi needs its technology systems to be highly available and redundant. As part of building that redundancy, Consultant showed G&J how using Microsoft’s Windows Azure platform would provide them with disaster recovery for its critical authentication workloads. Those workloads include Active Directory for user authentication, Directory sync for synchronizing users and groups between their on premise network and the cloud, and Password sync, which allows users to have single sign on abilities for their desktop computer and web applications. "Azure's infrastructure as a service allows us to have full functionality to authenticate users without on premise equipment, so if we lost our datacenter, our employees can still fully communicate," Witzgall said. With Azure, resources are readily available and accessible, user authentication requests are quick because Azure sits in the same data center as Office 365, and companies do not have to build the hardware or obtain software licenses to run it from their own data center. Removing basic blocking and tackling technology maintenance tasks like email, backups and worries about disaster recovery allow Witzgall and his team to think more about how they approach the business and how they can make employees more productive. "One of the biggest benefits is that Office 365 allows us to give our sales team all the information they need to get their jobs done," Witzgall said. Coupled with Lync, employees have "the tools they need to make a sale and to make more sales. Without a productive sales team, the company isn't going to grow." G&J continues to grow their partnership with Consulting company. “They are on our same wavelength for outsourcing and being efficient. The consulting company continues to find ways to gain funding for us and use technology even if it means less revenue to themselves,” concludes Witzgall. Coca-Cola Enterprises (CCE) employs approximately 72,000 people in 431 facilities around the globe. Much of its workforce is mobile with 55,000 vehicles and 2.4 million coolers, vending machines, and beverage dispensers. With increasing competition in the marketplace, CCE needed a more effective way to collaborate with its employees, to increase its productivity, to enable better flow of information and to create more time for sales persons to engage with customers. Its worldwide presence required employees and executives to spend numerous hours on the road every week, travelling to internal meetings. With Microsoft® Online Services technologies, CCE can save travel expenses through online meeting tools and collaboration platforms that span time zones and geographies. Coca-Cola Enterprises (CCE) is the world’s largest marketer, producer, and distributor of nonalcoholic beverages, which it delivers with the industry’s most effective marketplace execution. CCE’s increasing competition was resulting in declining revenues. This required company executives to launch a new strategic direction, mandating a platform to communicate and engage with all employees. Microsoft deployed a hosted worldwide intranet, messaging and collaboration tools which are accessible to all employees from any device, enabling employees to boost productivity and time with customers. Coca-Cola Enterprises (NYSE: “CCE”) is the world's largest marketer, producer, and distributor of Coca-Cola products. Coca-Cola Enterprises’ growing product portfolio includes the world’s greatest brands and beverages which they deliver with the industry’s most effective marketplace execution. Today, they serve 419 million consumers throughout North America, Belgium, France, Great Britain, Luxembourg, Monaco, and the Netherlands. They employ approximately 72,000 people and operate more than 431 facilities, 55,000 vehicles, and 2.4 million coolers, vending machines, and beverage dispensers. Coca-Cola Enterprises faced strong competition from other beverage companies and needed a way to work more effectively with their customers and partners. This required innovation and a new way of doing business within the corporation. In 2008 CCE acknowledged their current communication platforms were no longer enabling the innovation and collaboration required to take them to the next level to compete in an increasingly demanding economic environment. Communicate with all Employees: CCE required a centralized platform on which to promote the company’s initiatives. Its messaging was based largely around e-mail, which was unable to reach its largely mobile workforce. Chairman and CEO John Brock and CIO Esat Sezer agreed that in order to evolve the company culture and improve customer relationships at CCE, the leadership team needed the ability to communicate with all CCE employees, especially those managing day-to-day operations in the field. Most of the diverse CCE personnel work in a distributed manner. Employees in manufacturing facilities had limited access to the corporate network. The mobile employees of their delivery fleet who are on the front line with the customers, making sales and positioning the CCE products in store environments, also lacked convenient access to company e-mail and content. Additionally, CCE needed a way to drive action and information to all employees in their business by role. Current infrastructure did not allow for this, making it difficult to find appropriate content in a timely manner. Kevin Flowers, Director of Enabling Technologies, says, "John Brock, our CEO, challenged us to find better ways to connect all of our employees. He asked us to create a unified way to reach all of the field resources for more than 400 locations in the U.S. alone, SharePoint Online addressed those challenges and helped us launch from a legacy infrastructure to a solution which provided better business value to all of our people." Deliver a Unified Collaborative Workspace and Corporate Intranet: Taking on a new project like building a corporate intranet was exciting, yet daunting, as IT resources were engaged on many other initiatives as part of their transformation journey. IT considered leveraging partners to address their messaging needs and wanted to expand this to include the development of their corporate intranet. Both solutions needed to support mobile devices to reach employees in manufacturing facilities and the field. With many older systems, CCE had several partners providing dozens of communication and collaboration solutions. CCE saw an opportunity to optimize its infrastructure by broadening its relationship with Microsoft. With the implementation of Microsoft Online Services, which includes Microsoft SharePoint® Online, Microsoft Exchange Online, Microsoft Office Communications Online, and Microsoft Office Live Meeting, CCE consolidated and streamlined its IT partnerships and enhanced its focus on providing value to the business. CCE deployed its corporate intranet on SharePoint Online as its primary collaboration platform, which included content management, enterprise search, workflow, line of business integration, and rights management capabilities. In its assessment of whether to upgrade its current platform or transform the company to a hosted model, CCE considered options presented by several major software and service providers. CCE desired a partnership where it could utilize its enterprise software on premises with integrated software services in the cloud, and turned to Microsoft to execute upon its objectives. Planning for the project began in mid January 2008 and was completed by mid May. Microsoft Exchange Online and Microsoft SharePoint Online received “service acceptance” by July and user migration for both began in September.By the end of 2008, 23,000 users had been migrated to Exchange Online, 30,000 users were on SharePoint Online, and 10,000 users had migrated from IBM Sametime to Microsoft Office Communications Server for instant messaging. It added Microsoft Office Live Meeting for Web and video conferencing in April 2008. A fundamental shift occurred in how CCE viewed Microsoft services and capabilities running in Microsoft data centers, not as an outsourcing arrangement, but as a security-enhanced extension of CCE’s own enterprise network. The Right Information at the Right Time CCE decided to use Microsoft integrated communication and collaboration tools to streamline communication across its entire organization. A critical component of the corporate intranet portal at CCE was the integration of SAP user role information into its on-premises Active Directory® service and its Microsoft SharePoint Online environment. This will allow CCE to target the right information to the right employee based on roles outlined in SAP. By integrating SAP data into SharePoint sites, CCE employees can access data through recognizable Microsoft Office programs, giving employees the ability to make information for business operations easy to find, share, and update. Previously, CCE did not have a common solution that enabled document management. Documents that needed to be shared with colleagues were housed in shared folders on network drives, sent via e-mail, or stored in team rooms, all of which were limited in access, version control, and searchability. In phase II, CCE will be expanding the Microsoft footprint to reach an additional 42,000 deskless workers who work in the field or in sales/distribution facilities. These employees do not have computers but will be enabled in phase II to have access to the intranet via Microsoft SharePoint Online through computer workstations at their facilities. Additionally, Microsoft is co-developing a sales force automation system that will further take advantage of SharePoint Online and enable local merchandisers to be more efficient in getting the things they need into the outlets and stores. CCE will also be using Microsoft Office Communications Server desktop voice and video for multi-user applications and adding more than 10,000 BlackBerry users. We have been talking about upgrade path for Microsoft Office 365 Business and Office 365 Business Essentials. Today, we going to discuss about upgrade path for Office 365 Business Premium. 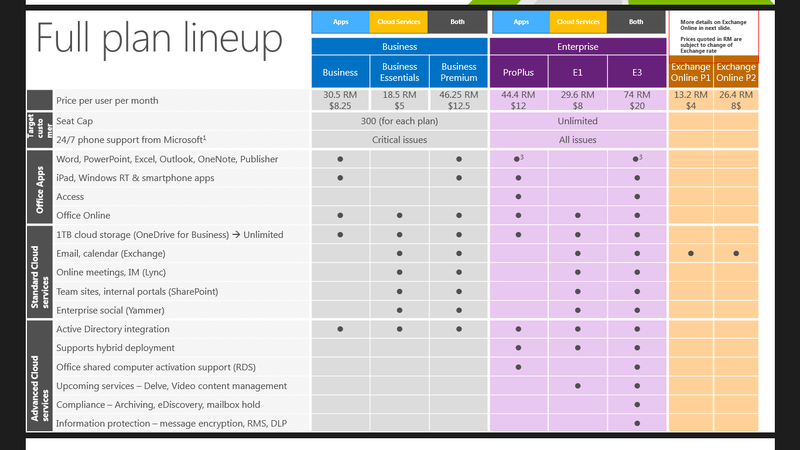 Office 365 Business Premium is a plan for combination of both Office 365 Business and Office 365 Business Essentials. This mean you want both Microsoft Office and Email Outlook Exchange. Of course, you get 1TB of One Drive for Business per user for backup and Disaster Recovery, which is effectively unlimited storage for backup and sync with your hardware for Disaster Recovery. Alternatively, your company can add other standalone online plan. Like Microsoft Project Online, Visio Online or Dynamics CRM Online etc. What if you intend to subscribed for or currently using Exchange Online Plan 1? Or if your company want to included Microsoft Office. Then, your company can upgrade to Office 365 Business premium. Then your company can add stanalone plan like Microsoft Project Online, Visio Online and Dynamics CRM online.